In almost any shape and size, the modern office chair is a tool for mobility as much as for seating. With a multi-legged base and articulating casters, it allows for movement in all directions and lets you traverse your space without ever getting up. Though this is convenient — and if you do it right, even fun — it takes a toll on your flooring. Carpets fray, hardwood gets scratched, and even linoleum wears through over time. 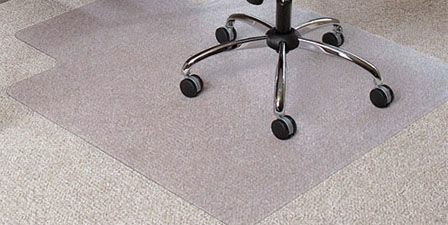 Make an easy investment in the life of your floor, then, with a durable chair mat from Source. We carry a variety of sizes and styles to suit your particular flooring, including our new tempered glass chair mat that provides extra durability and lasting shine. Visit Source today and show your floor some love. Source Office Furnishings — Making Your Office Work Better!